Express Jeans is our factory dedicated to the manufacture of jeans and woven garments for the national and international markets, with significant growth in the Peruvian textile industry over the last five years. 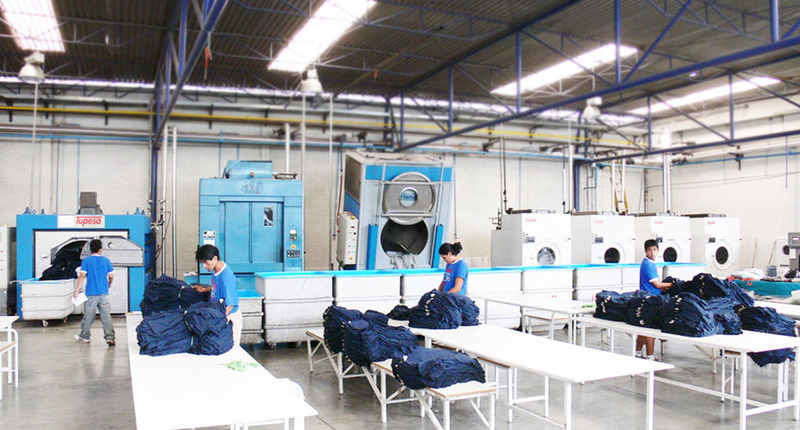 Express Jeans also offers an excellent industrial washing service for manufactured garments, for use by Topitop’s partner companies as well as others that require it, meeting customer expectations regarding post-wash quality retention. create effects in line with prevailing fashion trends), and culminating in quality assurance. In this way, we provide our customers with a variety of washing processes, according to their demands and needs. We also offer a fine direct dyeing process, to supplementing washing, process, when required by customers. Here we draw on sophisticated modern machinery, enabling us to deliver clothes free from texture wear or abuse accrued during the preceding production processes. Hang tagged: Creasing using staples. Targeted: Worn with permanganate spray. Destroyer: filled rips and scrapes. Emerized: Emery-like effect achieved on fabrics, giving rise to a frizzed finish on one or both sides of the fabric. This allows us to provide a range of finishes according to our customers’ requirements and preferences in their fashion designs. garment washing details meeting the technical specifications required by customers for each garment.